People studied cells and tried to see what made people ill. They began to acknowledge the existence of micro-organisms and to start to fight against their effects. In 1865 hospitals began to introduce antiseptics into the operating theatre, and the effects were startling. Vaccinations had been discovered several years before and became used increasingly during the period. Doctors started using anaesthetics during operations, and these became popular when even Queen Victoria used them during childbirth, and the first women doctors became qualified. Elizabeth Garrett Anderson was Britain's first woman doctor. At first she trained as a nurse in London, but her professors helped her and she studied in her spare time and was allowed to work as a medical practitioner when she was 29, even though not fully qualified. She finally had to go to Paris and take her medical exams in French. Elizabeth Garratt Anderson fought for the right for women to become doctors and in 1876 the Government passed the Medical Act, which allowed this to happen. taught. In 1832 the family emigrated from Bristol to America. Mary did not want to be a housewife or a teacher and decided to study medicine. Mary studied medicine as a private pupil of prominent doctors in Philadelphia. She was braver when dissecting animals than many of her male colleagues but still no medical school would accept her because she was a woman. 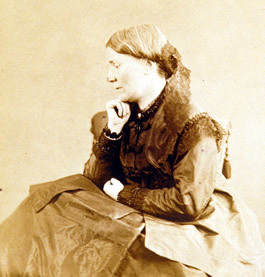 In 1849 she finally graduated and thousands of people came to watch the ceremony in Geneva. She wanted to go on to study surgery at Paris, but was not accepted, so she worked in a Paris hospital as a student midwife. Whilst working there she caught an infection and lost the sight in one of her eyes, which meant that she could no longer hope to be a surgeon. In 1851 she returned to New York and started a small practice there.